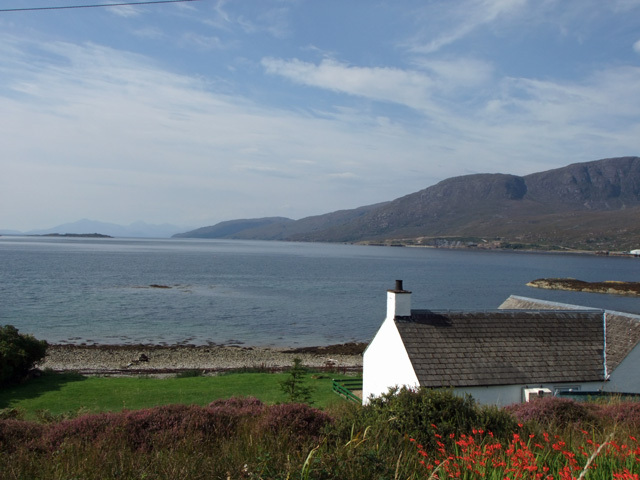 Ceol-na-Mara (Gaelic for Music of the sea) cottage is situated on the shore of Loch Kishorn offering superb loch views to the Applecross Mountains and in the distance the Cuillin mountains of Skye. This traditional Highland cottage has been fully modernised, affording self catering guests the convenience and comforts of home on the inside, together with the magical beauty of the Western Highlands on your doorstep and an ideal centre for boating, fishing, hill-walking, climbing, wildlife, seal spotting, cycling and relaxation. The picturesque crofting village of Kishorn is set in one of the most dramatic and beautiful, tranquil corners of the West Highlands of Scotland. Kishorn is a sleepy little village, quiet and unspoilt, with traditional houses scattered along the shore and neighbouring hillsides. The craft shop in the village "Patterns of Light" sells local crafts and paintings. The owner makes and sells dreamcatchers and does workshops - great for adults and children on a wet day (you would need to book though). 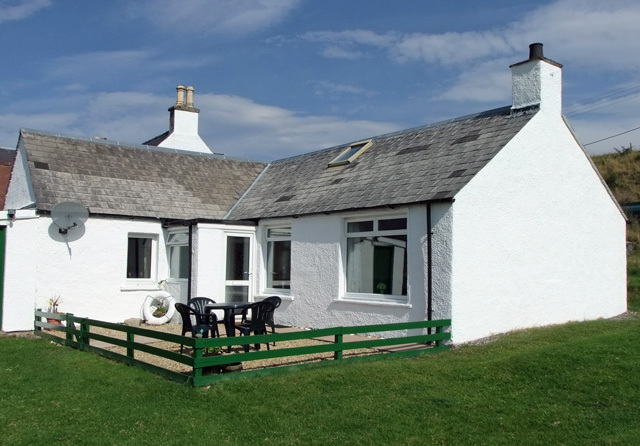 The cottage is situated within easy reach of many places of interest along the West Coast. Nearer to home, the award winning Kishorn Seafood Bar is open during the summer months and, very popular with tourists and locals alike, is approximately a mile from the cottage. There is a wealth of art/craft studios in the local area, including two well-known artist's studios in Kishorn itself. 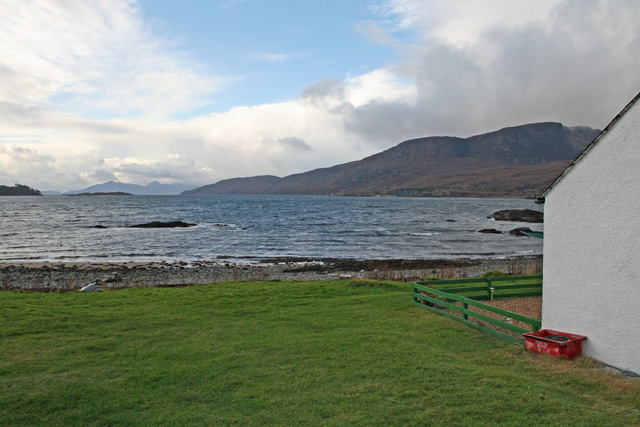 Lochcarron, which is approximately 6 miles to the east of Kishorn, has a restaurant, three hotels and a café. The Spar supermarket for groceries and papers and Maclennan's butchers for meat and fish, (they also visit Kishorn twice a week in their van). The village also has a bank, petrol station and a doctors surgery. In Torridon, there is a Countryside Centre devoted to red deer and other wildlife in the area. 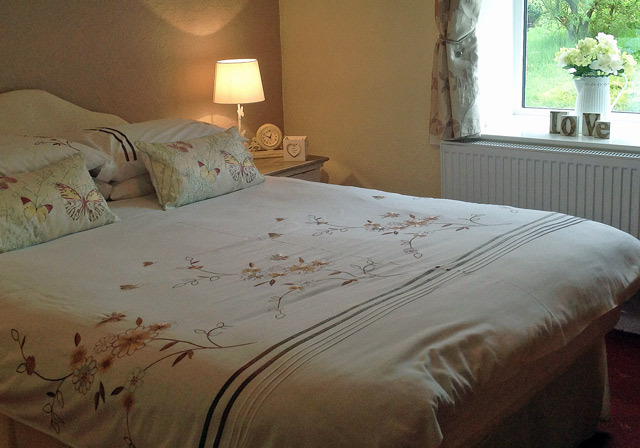 The cottage is well equipped, cosy and is an ideal base for those wanting to get away from it all. Lounge with views over Loch Kishorn. Open fire, TV, CD player, radio and DVD. 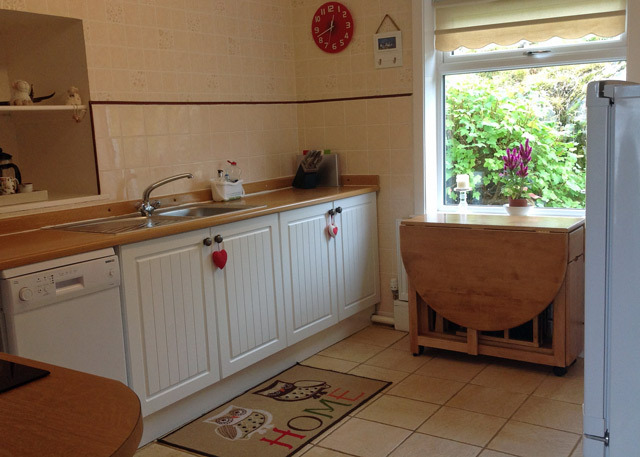 Kitchen equipment includes; electric oven, hob and grill, fridge/freezer, dishwasher, washing machine and tumble drier, microwave and toaster. Towels can be provided at a small extra charge. Lovely cottage in a beautiful setting. Wonderful views to Skye and we enjoyed watching vehicles travelling up and down the Bealach na Ba to Applecross. Our dog enjoyed paddling in the loch and his walks up the hills. The scenery in the area is just stunning. Can't wait to return. Our second stay in this wonderful, comfy, home-from-home cottage. A great cotttage in a fantastic location. So much to see and do. Fascinating arts and crafts, great places to eat, and inspiring scenery. The cottage and Wilderness Cottages can't be recommended highly enough. We have just booked our 3 year at the cottage which we hope speaks volumes. 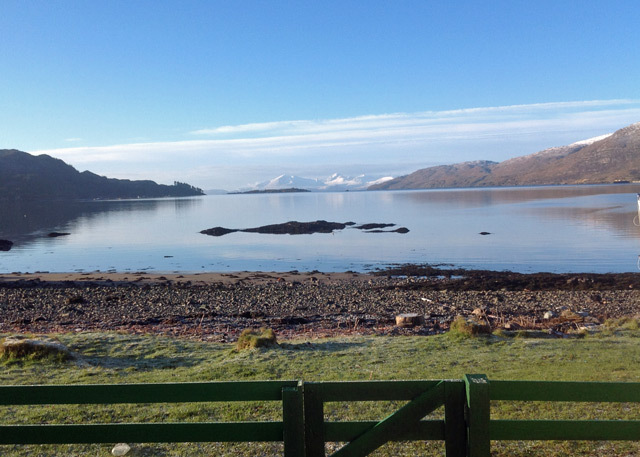 The cottage is homely and cosy right on the Loch with the most spectacular view. Listening to the lapping water with the silence around you, is very special. Lots of beautiful walks around, it is remote and quiet yet with a cafe and restaurant, a very short drive away and with a pub and Spa 6miles at Loch Carron. Plus seal watching from your lounge window is very special too. Wonderfully peaceful location. Comfortable cosy cottage, with a view to die for!! Remote but not too remote, placed in a beautiful setting - picture postcard scenes. 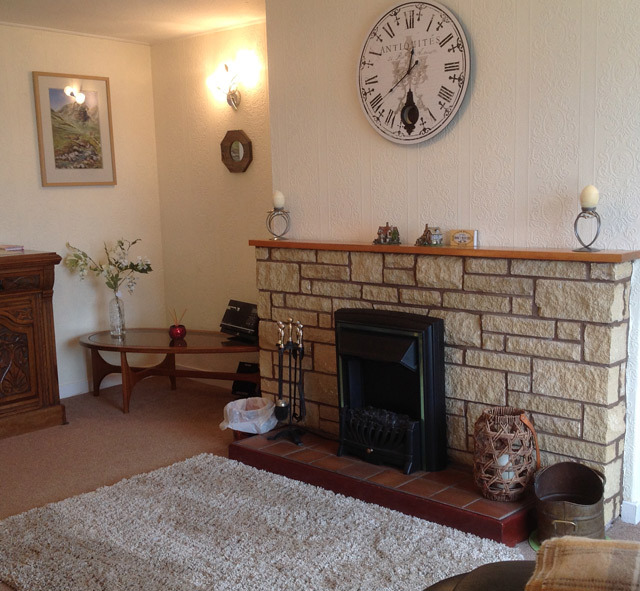 This homely cottage was ideal for us with a large lounge, well equipped kitchen, bathroom and two bedrooms - with an outside area to sit when the weather is fine. 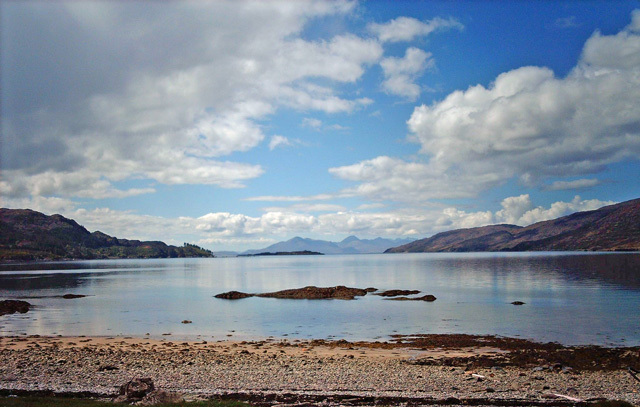 Surrounded by wonderful Scottish countryside the cottage is idea for trips to Applecross, Lake Carron - and the local fish restaurant and cafe renowned for its fresh seafood. We thoroughly enjoyed living there. Ceol-na-Mara is a great cottage in a fantastic location. The views out to the Cullin Ridge on Skye were staggering. A few niggles. I took my ipod and noticed an ipod dock but no means of conecting the dock to the stereo system. There was a good collection of DVDs although we did notice that for some reason the STV satelite channels didn't work. A dishwasher would have been a plus. I have to say overall the cottage was brilliant and would definitely recommend it. The dogs loved it too. We had a very pleasant stay in Ceol na Mara. 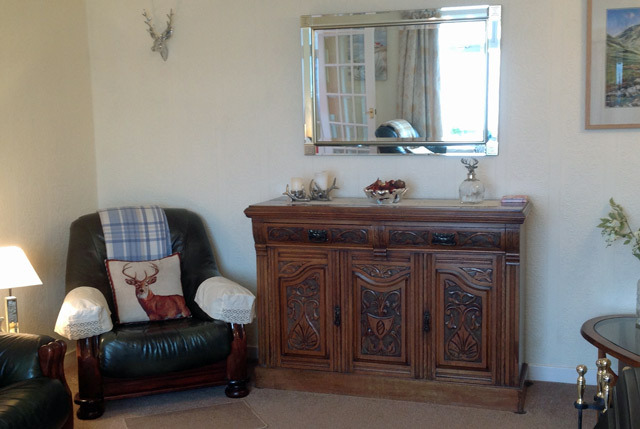 The cottage is comfortable with a great view and the beach on the doorstep. The kids enjoyed themselves on "our own beach" while we sat in the garden enjoying the view. We are already considering returning next year. Thank you for the use of Ceol na Mara, the whole package was absolutely great the cottage itself was excellent very comfortable and the situation was stunning. We both enjoyed our walking/cycling expeditions and did three Munros plus Bienn Bhan.I certainly hope to return and will recomend Wilderness Cottages to my friends.